Whilst I’ve been unable to spend time on the blog, I’ve been updating the Ummah Reads page on Facebook and sharing quite a bit of good information and news at UmmahReads on Twitter. However, I did have a quiet moment today and decided since I had the computer all to myself I would post about some of what’s been happening and what I’ve found recently. MiniMuslimeen magazine is giving away a free copy of its first issue to the first 100 people who email them at info@minimuslimeen.com. MiniMuslimeen is a wonderful magazine for Muslim children that teaches children Islam in fun and inspiring way. AmericanMuslimMom has a giveaway going on as well on her site. These books are not Islamic but they are great picture books for children 7 years and under. Go have a look here. My little one has grown into an independent reader, MashaAllah and now he almost always refuses to be read-aloud to. Bed time used to be special times when we would sit quietly and I would read to him. Not anymore; he wants to read all on his own! I know I should be happy that he can read on his own and I am, AlhamduLillah . But I am also aware that he still needs to hear words being enunciated properly in order to help him pronounce and spell words correctly. In addition, reading aloud has the added benefit of helping him to learn how to express himself through reading with different intonation, voices etc. I am slowly negotiating to get back to the bedtime routine of reading aloud together and it seems to be working. First I let him read about 10-15 minutes on his own, then we select a book to read together for about 20 minutes. What this means is that we have to start getting ready for bed earlier in order to give us enough time for him to read and then for us to read. I recently came upon (but have not read) the Jannah Jewels series. It’s an adventure chapter book series that aims according to the website to focus on Islam’s rich history. The four characters are all girls who have special skills which they use when they go on their trips. The first book in the series (there are three books in all) is currently available; it’s title “The Treasure of Timbuktu”. For more information on this new series that looks like a great read for children 8 to 12 years, check out the website. Next up on my list of finds is Owh So Muslim, a website that contains information about essential aspects of Islam presented in an easy-to-read format with fantastic manga inspired graphics. Right now there is a beautiful description of the life of Prophet Muhammad (pbuh) up on the site (see here). Some of the graphics and information are available for free download as well. I can see parents and teachers using this at home or in the classroom (school or weekend Islamic school). And finally I listened to a poem called Jannah being read by Ammar Al Shukry with the words cleverly appearing on the screen that makes reading the poem as much fun as listening to it. A video that young people will definitely enjoy! Listen here. And that’s about it for now. I pray that I can get back to posting here regularly once more. – -> Remember: Please rate and share this post if you liked it! See below for options available. And of course you are welcome to leave a comment below or email your thoughts/questions (just use the contact tab at the top of the page or send email to muslimkidsbooks @ gmail . com). Shukran (thank you). Reading aloud to your child at bedtime is a great way to soothe your child especially when it forms part of the bedtime routine. Infact some children look forward to bedtime just so that they can hear stories! 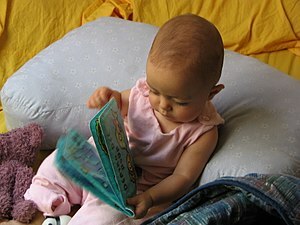 Reading aloud at bedtime also helps to build a child’s love for reading and develops his/her listening skills. So I was delighted to read a wonderful post over at The Well-Read Muslim outlining how Muslim parents can help calm and relax their children at bedtime through the use of stories. The post describes what a parent can do in the event that s/he cannot be there in person to read. The solution? Provide your child with the an audio recording of stories or surahs from the Qur’an. You may even consider recording yourself reading aloud the story. Read more here.